Well-known mystic and magus Aleister Crowley designed the highly respected Thoth Tarot Deck (U.S. Games Systems, ISBN 0913866156), which first appeared as an appendix to his study of Tarot, The Book of Thoth (published in a limited edition in 1944). The inspired, eclectic art, painted by Lady Frieda Harris (see illustration, left), shows the influence of numerous significant styles, including Art Nouveau, Art Deco, and Cubism, and a variety of cultures, especially Ancient Egyptian. Illustration (left): The Fool from The Thoth Tarot (copyright © 1944 Ordo Templi Orientis). Click image for a larger one. Thoth (pronounced Toht, rhymes with boat) is named after the Ancient Eyptian god of magic and wisdom. The deck clearly reflects Thelema, a philosophy-religion founded and promoted by Crowley; therefore, the cards have minimal Christian content, yet plenty of esoteric symbolism, both traditional and innovative. Crowley clearly and systematically related Thoth to Cabala and astrology, placing Hebrew letters and astrological symbols on the cards. Doing so, he followed the teachings of the Golden Dawn – albeit occasionally modified or extended by him. He, like Waite and Smith, who created RWS (discussed earlier), was a member of this orgnanization. As a beginner, you may use Thoth without understanding the complex implications of these matters, but eventual familarity with them will enhance your experience significantly. Beginners sometimes find the imagery confusing and too dark. However, reading a book specifically written with the deck in mind (suggested below) is invaluable and will help you to understand and use this deck effectively. Certainly, Thoth possesses profound depth and, with RWS decks, is among the most important of modern times. In Thoth, each numeric card (with the exception of Aces) bears a keyword that summarizes its meaning as best as a single word possibly can. 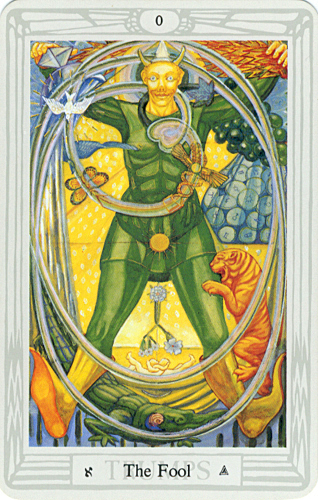 Among the Major Arcana, Adjustment (which corresponds to the traditional Justice) is numbered VIII, and Lust (which corresponds to the traditional Strength) is numbered XI. Temperance is re-named Art; and Judgment, Aeon. The court cards are Knight, Queen, Prince, and Princess. Cards measure approximately 2 3/4 x 4 3/8 inches. Their backs are not reversible. To view more cards from this deck, click here. If you want a deep deck which includes clear, systematic references to Cabala and astrology, and are comfortable with esoteric and Thelemic symbolism, Thoth may be right for you. If you elect to use it, you may wish to read The Crowley Tarot by Akron and Banzhof or the highly recommended Book of Thoth by Crowley.